Recently, Sharp Professional introduced the PN-L703W/603W displays into their suite of AQUOS BOARDS. These brand new wireless AQUOS BOARDS are available only in 60” and 70” making them great for boardrooms and smaller huddle rooms. In addition, BYOD (Bring Your Own Device) is easy with a built-in wireless controller. Its intuitive design enables its users to collaborate better regardless of the operating system being used on laptops, phones or tablets. Another impressive feature about the PN-L703W/603W displays is that they can display onscreen content in TWO ways: in a 2 x 2 split screen or any one of the individual screens can be enlarged full-screen size. All of it done by the built-in wireless controller that allows the PN-L703W/PN-L603W to give off its own SSID once it is set in the wireless mode. Because no data is being stored during wireless connection, you won’t have a problem leaking any confidential info. Some of the most talked about products that we have been seeing within the Pro AV industry are ones that involve wireless collaboration. Other popular products that get talked about are interactive pieces. Today most display manufacturers have a product that has touch capabilities whether it is a projector or a flat panel display. With this being said the manufacturers of the wireless collaboration products sometimes try to partner up with the display manufacturers to showcase these collaboration products. Throughout my travels in the Pro AV industry, I have not seen many all-in-one solutions that involve wireless collaboration and a display with the exception of a few and the ones I have seen did not have touch capability until now. These Aquos boards have gained a lot of popularity in the education market, along with teaching hospitals. They have become more and more popular in the corporate board rooms for video conferencing and collaboration. With the pen software, you can jot down ideas, save the file as a PDF and email it to colleagues or customers working on the same project. Sharp is primarily known for its display hardware and technology. However, Sharp also excels in software development that compliments hardware products. This is something to take note when specifying a project, do you want your hardware from a company that specializes in software or an Aquos board which is made by Sharp a company that specializes in hardware. One of the best things about the new wireless capable AQUOS BOARDS is the software needed to collaborate comes free in the box. The SHARP Pen Software is not only easy to use but has a special handwriting recognition function that converts selected onscreen handwriting into standard text. Sharp has been an industry leader in touch 60” and above with their AQUOS BOARDS products. So with these new additions, I am looking forward to seeing how they will further evolve over time. Included is the latest version Sharp Pen Software 3.0, which is, even more, user-friendly than previous versions. The built-in web search (AQUOS BOARD must have an internet connection) and smoother handwriting recognition, along with a multitude of other features, can be customized using its new on-screen menu. The new pen software supports multi-touch and comes with Touch Display link software. 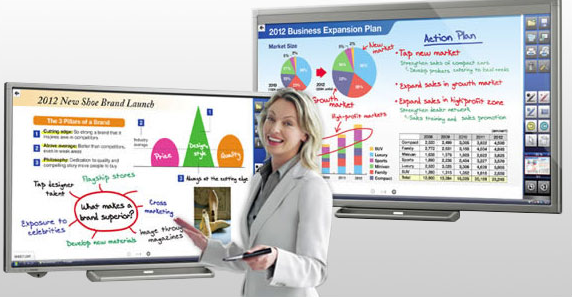 Touch Display Link 2.0 is an effective and multilayered communication tool and BYOD. Handwritten notes and drawings are done in real time and can be viewed at the same time on the AQUOS BOARD and mobile devices.